This is the second in a series I recently introduced on Barbecuebible.com called What I’m Grilling Now. No exotic dishes from my travels around Planet Barbecue. No icons of barbecue, with the attendant disputes: charcoal versus wood; dry rub versus wet; mustard versus vinegar sauce, etc. Just what I, Steven Raichlen, am grilling now—at home, for my family, without a special trip to the market. In other words, what Raichlen cooks on a normal weeknight using ingredients from the pantry or fridge. “The French say the hardest thing to cook is a perfect roast chicken,” the Hermit observed. By the way he said it, Claire sensed she had measured up. I wrote these words in my 2012 novel, Island Apart. While that book is a love story, not a cookbook, it does suggest the primal importance of a well-roasted chicken in human gustatory happiness. It also reveals a myth perpetuated by the French chefs I trained with in Paris—that a great roast chicken is a difficult dish to make. That myth has something to do with the contradictory attributes of a perfect roast chicken: skin so crisp it crackles when you bite it, yet meat so moist it squirts when you cut into it. Then, there’s the confounding nature of a chicken’s anatomy—white breast meat that’s perfect at 165 degrees F and dark leg meat that tastes best when cooked to 175 degrees. In other words: how do you cook the latter without drying out the former? Well, call me a myth buster: the truth is it’s easy to roast a chicken—especially if you do it on the grill. How easy? 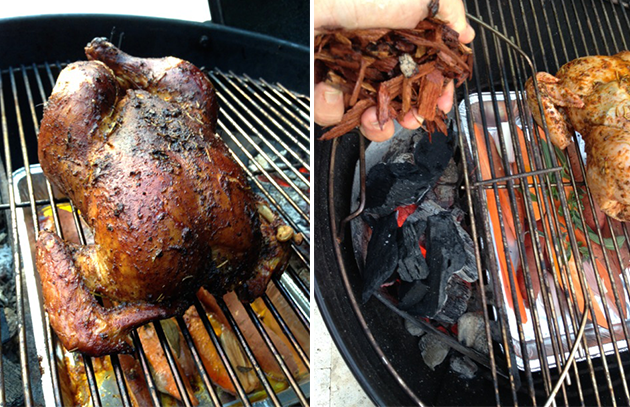 Put it this way: smoke-roasted chicken is a dish my wife and I make once a week on average. It starts with the chicken—a local farm-raised bird when we can get it. (Easy in Martha’s Vineyard; more challenging in Miami.) The best widely available supermarket bird we’ve found is Bell & Evans brand organic chicken. The next step is to season the bird inside and out with salt and pepper or a simple herb rub like my Project Smoke Greek Island Herb Rub. Sometimes we’ll stuff fresh sage, basil, tarragon, or other fresh herbs under the skin. When I make the chicken, I truss the bird, that is, tie it or skewer it into a compact cylinder. I do this for aesthetics—a trussed bird looks smart and professional. My wife doesn’t bother with trussing, and once again she has a point. When you roast the chicken untrussed, the heat penetrates the cavity and browns the inside of the legs more evenly. If you want to truss your bird, you’ll find a cool bamboo skewer trussing technique in Planet Barbecue! on page 355, and step-by-step photos of traditional butcher string trussing in How to Grill on page 204. Because we’re talking about a simple weeknight dinner here, we usually cook the vegetables right with the chicken (or in this case, under it). These usually include a sweet potato or a couple of Yukon Golds, some organic carrots or beets, a shallot or two—any root vegetable loaded with flavor. I cut the veggies into finger-size pieces, so they’ll roast quickly and evenly. I arrange them in a single layer in the foil drip pan I place under the chicken. (It’s important not to overcrowd the pan, otherwise the vegetables will stew, not roast.) The tubers sizzle in the melting chicken fat and juices (stir them once or twice), which makes these veggies you’ll definitely want to eat. Now, here comes the secret my French chef mentors would never have dreamt of. You don’t cook the bird in the oven; you smoke-roast it on the grill. I prefer a charcoal grill—it’s easier to smoke with charcoal. I set it up for indirect grilling, placing the drip pan with the vegetables between the mounds of coals under the grate. The bird goes on the grate over the drip pan. I toss a handful of soaked oak or apple wood chips on each mound of coals. Cover the grill. Adjust the vents to obtain a temperature of about 400 degrees. And mix myself a nice vieux mot (our new house cocktail, made with gin, lime juice, simple syrup, and St. Germain). An hour or so later, we sit down to a gorgeous roast chicken dinner—the bird’s skin bronzed with wood smoke and crisp as flatbread, the meat smoky, tender, and lasciviously moist. The vegetables are crusty on the outside, meltingly tender, and perfumed with smoke and chicken fat. Who says Americans can’t teach the French a thing or two about cooking? Click here to see step-by-step photos. What are you grilling now? Post photos and descriptions on Facebook or the Barbecue Board.